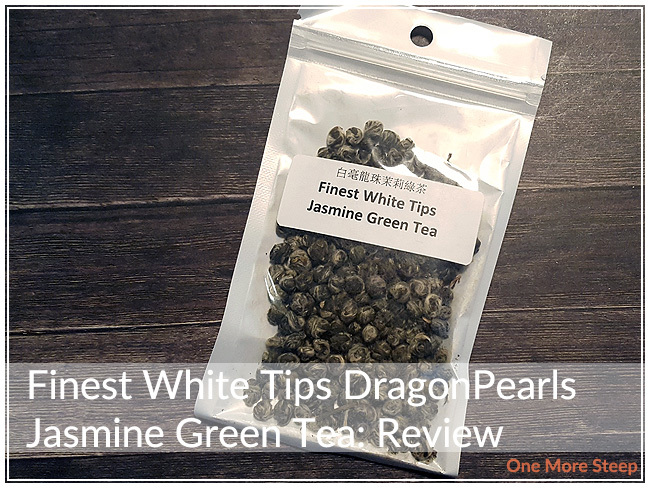 And the winner for the longest name possibly ever to grace a review here on One More Steep goes to… the Finest White Tips Dragon Pearl Jasmine Green Tea! This was a tea that I picked up at the 2016 Vancouver Tea Festival from The Chinese Tea Shop’s booth. Part of the reason why I picked it up is because I love watching rolled tea open up when steeping, and also because it smelled amazing. There’s a strong jasmine smell with these pearls, which is understandable given the name. I love that I can see the variation in colour in the leaves with the tips being white, ans well as seeing the tiny hairs of the tea very easily. This tea is described on The Chinese Tea Shop website as being made with the “finest silver pekoe tips rolled into small balls”. The Chinese Tea Shop recommends making most, if not all, of their tea gong-fu style. I still lack the proper tea ware for that, so I made it in my normal glass tea pot. I steeped the tea in 79°C (175°F) water (the ‘green tea’ option on my Breville IQ Kettle) for 1 minute for the first steep. 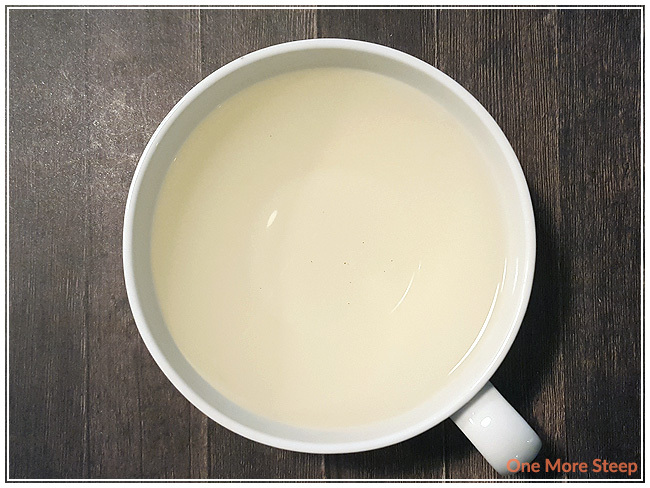 Finest White Tips Dragon Pearl Jasmine Green Tea steeps to a very pale yellow after the first steep, it’s barely noticeable in my white tea cup. There’s a great jasmine flavour that is immersed into the tea. With the short steep in the low temperature water, I’ve found zero bitterness. There’s a slight sweetness that I quite enjoy and found to be pleasant. The tea itself is very smooth and that makes for an easy to drink tea. 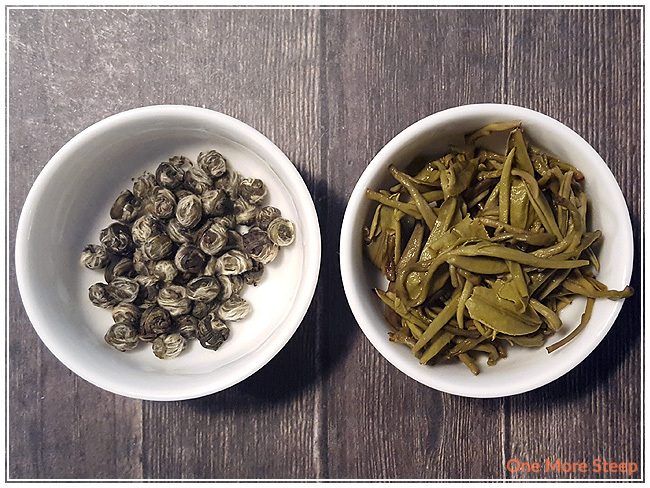 I resteeped Finest White Tips Dragon Pearl Jasmine Green Tea a few times, increasing each subsequent steep time by 30 seconds. The colour of the tea gets to be a pronounced golden yellow as each steep occurred. I managed to get a total of seven steeps with this tea before it started to get a little bit lacking in flavour. I loved The Chinese Tea Shop’s Finest White Tips Dragon Pearl Jasmine Green Tea. Yes, it is on the pricier side when it comes to jasmine green teas – this I will fully admit. However, the ability to steep again and again just goes to show that it’s a high quality tea. Less expensive jasmine green teas lack the ability to be resteeped over and over again. 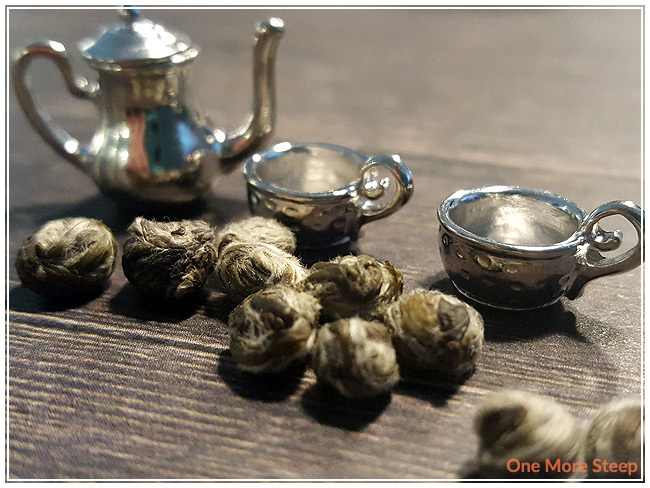 I loved watching these dragon pearls open up, and found the tea to be smooth and delicious. It’s not a tea that I would have every day (I don’t think I could afford for it to be a daily cup of tea!) but it’s definitely one that I could see having on special occasions or when having company over as a little bit goes a long way.